It often happens these days that around 12.20am I find myself sitting inside a concrete stairwell. The electric light is harsh and the paint is peeling off the walls. It is not a pretty place but it is break time at work and this is where the casual workers take respite. We have been scurrying incessantly around the function room; now we sit exhausted on the steps, eating whatever leftover food the kitchen can supply. Here, food takes on a blessed quality. 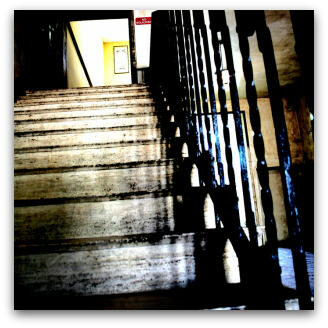 Once appetites are satisfied the reigning silence lifts; the shabby stairwell is transformed into a meeting place. On the bottom step, two young men talk quickly in Nepalese. One step up, Bangla is the favoured language. Step higher and there are conversations in English, Indonesian, Hindi and French. Among the young people sprawled on each step, the energy at that time of night is extraordinary. Although a tad shabby, the stairwell is one of Melbourne's best academies of learning, a place where real insights can be gained. Conversation topics range from the daily life of an Indian village to the politics of uranium exports. In this stairwell I have heard quoted Byron, Shakespeare, and the New Testament and I've been lectured on the differences between Catholicism and Ethiopian Orthodox Christianity. The conversations we have in that stairwell unveil our varied identities. These contrast with the one dimensional identity presented to guests out on the function room floor: the anonymous smiling waiter with the black apron and the little golden name tag. In such a diverse group, the only shared story is our experience of working as waiters — we all clean dirty dishes and smile as if to say that serving guests beer brings us deep satisfaction. Instead, behind the facade donned for the function room floor, lies all the drama and stress of the lives of many foreign students in Australia. In the stairwell the myriad stories are accompanied by a narrative that I am not part of: that is, the insecurity of living and working as a foreign student with only temporary residency. The other night one confrere described the time spent working and studying in Australia as 'a bridge between two lives', a time when 'life is put on hold' and his whole being is directed towards securing permanent residency. After working from 7am all through the day, some students take an hour off before starting the night shift in this, their second job. And when they aren't working, they're studying. So of course, it is difficult for them to make friends and to build social networks with almost no time on their hands. By law, my stairwell companions are not allowed to work more than 20 hours per week. Being paid less than $20 hour means that, in order to keep to the law, foreign students must live bare and strained lives. And when a course at one of the inner city Melbourne 'institutes' costs up to $8000 a semester, working only 20hours is a difficult promise to keep. For some it proves so impossible to live within such scant means that they resort to working illegally and are paid in cash to avoid detection. This is risky; discovery means expulsion and the end of any hopes of attaining the holy grail of permanent residency. And if foreign students are working late night shifts in odd jobs and getting paid with wads of cash, what does that mean for their security on the last train home? All this should make us question Victorian Premier John Brumby's recent statement in India that Melbourne is one of the most secure places in the world for foreign students. Perhaps Melbourne and other Australian cities are relatively safe, but insecurity is made of more than physical peril. Another problem voiced in the stairwell, this time by a Nepalese student, was the impossibility of finding housing. He had applied many times for a room in a share house and each time had been rejected. He has been here for three years. He can't afford to go home and he won't go anyway until he has achieved permanent residency status. He is my age. I wonder how he copes without the personal support of a family. Insecurity pervades the lives of foreign students. Often forced to work illegally, tired from late night work and study, deprived of family and social networks, and in some cases stressed by the uncertainty of temporary residency status, their lives, we should assume, must be difficult. Yet, as a community, we are so often unaware of these difficulties. The people my companions and I serve at work may observe only a foreign face and a tray of drinks; they may see the Indian and Nepalese and African students who work with me as the generic 'foreign' student. But behind the facade there are complex realities which we need to understand. After returning from India, John Brumby could contribute towards securing the lives of students like my stairwell companions. A good start would be to persuade Australian governments to extend the number of hours per week they can work. Fabulous article, Ben. Keep up the good fight. You have persuaded me to put your article before my local MPs. (Should that be MsP? Or even MsPs?). I hope others do likewise. I hope this article will encourage thoughtful Aussies to make efforts to meet, discuss the lot of our migrants and foster empathy with them. Ben Coleridge's article reminds me of the days when I first arrived in Australia in the early 50s. We were the second wave of foreign students who came to this country to study, less than a decade after the end of the Second World War. As an Indonesian-born Chinese, I was often mistaken as Japanese by many drunken war veteran who fought in the Pacific war or were Japanese prisoners. We were only allowed to work during our term breaks. In those days, we didn't have the stairwells that Coleridge wrote about, neither were given the title of "International Students", we were simply either 'bloody Asians' or 'foreign students'. There were not network of organised support. Some of us who were Christians enjoyed the hospitality of our particular denomination.Others worshipped in make-shift living rooms. As there weren't many of us, we were not perceived as threats by section of the Anglo-celtic Australian community. It's true, that by comparison Australia is more tolerant towards people who look different to the local population. I know this as I'd rather stay and live here than the country of my birth where being Chinese has its problems. However, having said that we are all still learn how to live with each other in a constantly chaning circumstance. Prejudices and racism will always be found among sections of our community, to accept their existence is the first step towards multi-cultural harmony. To this end, we all have a long way to go. How can Melbourne be safe for overseas students, when it's not even safe for its local residents? Grog is ruining Australians. I'm not a Jehova's Witness but I have been to a party with them. Great fun, no grog no smoking!